Grocery shopping for your pet can be fun but it comes with a lot of deliberation and decision making. Many brands are represented on shelves; even when you have a list, you may not know what brand suits you the most. This article answers fundamental questions on Wellness and Blue Buffalo. By the end, you will know exactly which one to pick for your little buddy! 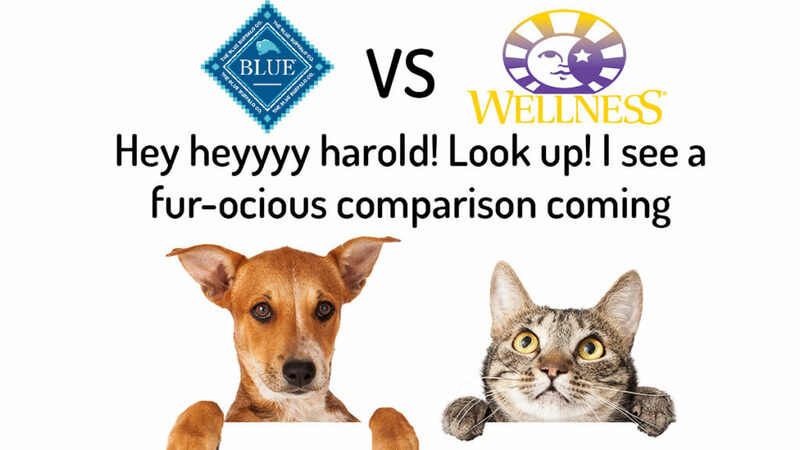 After you are done with this awesome comparison, check out Blue Buffalo and Wellness here to see the different flavors and pricing. Having prior product knowledge, especially when it comes to purchasing pet food, is a major advantage. As a pet owner, your best ally is a pet food brand that provides your pet with all the nourishment and nutritional value that they require to grow. This article answers fundamental questions on Wellness and Blue Buffalo. You will get insights on the brand history, principles, dietary content, product quality and safety, and more. In the dry food category, Wellness provides a significantly higher amount of protein. It exceeds Blue Buffalo with about 5 percent for cat food and 4 percent for dog food. In the wet food group, Blue Buffalo provides more protein with a slight difference. It is higher by 0.2 percent for dog food and 0.8 for cat food. Wellness is more expensive than Blue Buffalo across all food categories for cats and dogs. While both brands have a remarkably wide and robust product range, Blue Buffalo triumphs with 339 unique flavours. On the flip side, Wellness has a total of 230 flavours. Of both brands, Blue Buffalo has had more recalls. Wellness has been recalled 5 times and Blue Buffalo has been recalled 9 times. Check the current prices and recipes/flavors for Blue Buffalo and Wellness. As represented on the table, Blue Buffalo has a larger number of recipes than Wellness. Both brands produce all types of food products ranging from dry food to canned food and treats for cats and dogs. If your pet’s food does not provide the necessary nutrients, then it has no value. Pets function optimally and are healthier looking when their body is being nourished by the right nutrients. Conversely, pets suffer ailments or appear malnourished when their body does not absorb needed nutrients in the right proportion. Before you reach a decision on the brands in question, you must take a look at their nutritional components. This is important because pets generate most of the needed body nutrients from food. The most essential nutrients as recommended by AAFCO include protein, fat, and fiber. All pet foods have labels that indicate the percentage or proportion of the nutrients available in each serving. We are going to outline the amount of these nutrients that are contained in Wellness and Blue Buffalo on the table below. As illustrated on the table, Wellness leads in the dry food category as it supplies more protein and fat. However, Blue Buffalo supplies more fiber in this category. For the wet food group, Blue Buffalo provides more nutrients for protein, fat, and fiber. This is definitely an advantage for Blue Buffalo. You may wonder why protein, fat, and fiber are so significant in your pet’s diet. We will discuss these reasons below. Cats and dogs need essential amino acids but their bodies cannot produce or synthesize these independently, the protein content of their food makes up for this lapse. Among myriads of functions, protein helps to build their form and keep them in good shape. Their fur, paws, skin coats, bones are made sturdy by protein. In cases of wear and tear, protein repairs worn out tissues in their body. Do you know that dogs and cats never have to worry about their cholesterol level? Fat does not clog their hearts like it does to humans so you may want to allay your fears about this nutrient. Fat is needed in every balanced canine and feline diet but in the right proportion. Pets need energy and fat provides one of the main sources of energy, this is the first source of energy pets use before protein or carbohydrates. It gets better, pets are not self-sufficient because they cannot produce essential fatty acids which is needed by the body, they depend on fat for this. Digestion is a key part of nutrition; this is where fiber comes in handy. Fiber encourages bowel movement as it supplies bulk matter and water in the digestive tract. Fiber prevents overeating and reduces risk of obesity by giving a feeling of satiety during meals. It prevents other diseases like diabetes, hairballs, diarrhea, constipation among others. Pricing is of great essence in every review and analysis. What good is a product if you love it but cannot afford to pay for it? In our review, we put a premium on cost because we understand that budgeting is central to decision making. Luckily both brands are quite affordable. Food products are either measured by pound or by calorie so, your budget is determined by your shopping pattern and food preference. On the average, buying per kilocalorie is recommended because you get to eliminate the extra weight of moisture. Below is the cost for Wellness and Blue Buffalo. According to the data on the table, Wellness is more expensive than Blue Buffalo. They also offer 30% of your first autoship order which saves you a good chunk of change and makes your petfood ordering process automatic. Overall this has saved me a ton of time. The most common ingredients include Deboned chicken, chicken meal, brown Rice, barley, and oatmeal, peas, flaxseed, potatoes and sweet potatoes, carrots, kelp, spinach, pumpkin, and barley grass, blueberries, cranberries, blackberries, apples, pomegranate, menhaden fish Meal, chicken fat, dried egg, and fish oil, vitamin E, iron, zinc among others. Check out the current Wellness recipes and Blue Buffalo recipes here. Wellness has commendably remained relevant for more than 100 years! They are passionate about bringing balance to feeding. They maintain that food must be fun and nutritious. Healthy should not be approximated to boring. To ensure your pet’s wellness and glee during mealtimes, they creatively combine toppers, treats and mixers so that the same meals are not repeated times and over. At Wellness, it is common belief that mealtime is for a lifetime so meals should nourish the body and excite the soul. Blue Buffalo, a family-owned brand, was born out the tragic loss of Blue, a family dog. The Bishop family created the company to use food to combat some health problems suffered by pets. The Blue Buffalo’s mantra has always been “love them like family, feed them like family”. They maintain that dogs and cats are family members so, you will imagine that their meals will not be prepared without much thought. This clearly demonstrates that quality is not compromised in food production. This brand uses the best natural ingredients. One of their bestselling formula is named the Life Protection Formula. Get the idea? By a very narrow margin, the winner for this review is Wellness. Longevity is definitely advantageous for Wellness. Blue Buffalo almost matches up with Wellness save for her alarmingly high number of recalls. What Blue Buffalo lacks in the dry food category which is improved on in the wet food group. It even costs less than Wellness but I guess we can all agree that safety should come first.